With Tokyo winning this year's race as the first place in Japan to have Somei Yoshino cherry blossoms in bloom, which spots in the capital are best for viewing the flowers in their full glory? There are of course a number of famous viewing spots across Tokyo, such as Chidorigafuchi Park and Ueno Park, but in addition to these sites, there are also many hidden gems in the metropolis that deserve to be mentioned. So with just a few days to go until cherry blossoms reach full bloom in Tokyo -- predicted to be on April 2 by the Japan Weather Association -- why not try somewhere new this year? Local organizations across the city have been working hard to promote visits to the hidden gems in their area. In Tokyo's Chiyoda Ward for example, an "official guide map with information about the Chiyoda Sakura Festival" has been distributed free of charge. The brochure is issued every year by a local planning committee which represents the area's business and tourist interests. 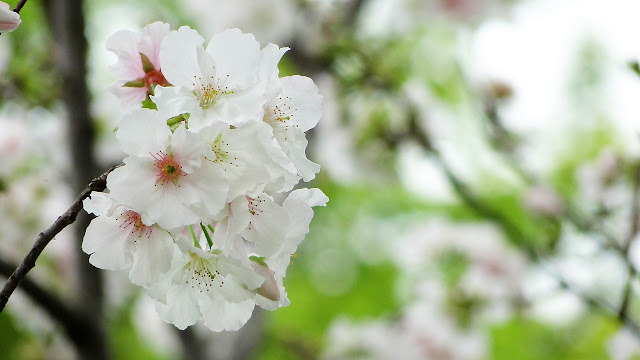 The Chiyoda Ward committee is keen to inform people that there are numerous cherry blossom sites worth visiting other than Chidorigafuchi. For example, as committee representative Chizuko Nagase points out, "The cherry blossoms near Sophia University, as well as those in nearby Shimizudani Park in the Kioicho district, are also pretty." In addition to distributing maps, Tokyo also offers educational brochures on cherry blossoms. For instance, the Edogawa City Environment Promotion Public Corp. has produced a brochure called "The Edogawa Ward Cherry Blossom Guide Book," containing a wealth of information about 20 recommended sakura spots across the ward, cherry blossom varieties, and also some helpful guidelines on viewing etiquette. Some 10,000 copies of the guidebook were issued on the occasion of the "National Cherry Blossom Symposium" held in Edogawa Ward in April 2016.